1. Eating pumpkins helps Protect your Eyesight. 2. Eating Pumpkins aids in Weight Loss. Pumpkins are full of fiber which helps to keep you feeling full longer. At an amazing 7 grams of fiber per cup and super low in calories (like their fall friend apples), pumpkins are an excellent choice of food to aid in your weight loss plans. 3. Eating Pumpkins can help Reduce your Blood Sugar. One of the amazing things about pumpkins is that research is now showing that pumpkin oil can be beneficial in preventing hypertension. 4. Eating Pumpkins may Help Prevent Cancer. As I mentioned in #1, the Beta-Carotene that is present in Pumpkins helps to boost the immune system. In addition to this Beta-Carotene may help play a role in Cancer Prevention according to the National Cancer Institute. 5. Eating Pumpkins may Help Improve your Mood. Pumpkin seeds are rich in a particular amino acid called tryptophan. This amino acid is extremely helpful in the production of serotonin which research has shown helps control our moods. 6. Eating Pumpkins will help Boost your Potassium. Just like bananas are known for their potassium levels, Pumpkins are also helpful. In fact, pumpkins have more potassium at 564 milligrams than bananas do. Potassium will help restore the body's electrolyte balance and helps our muscles to function at their best. 7. Eating Pumpkins may Help Patients with Diabetes. Recent studies are showing that pumpkins help to reduce blood glucose levels, help improve glucose tolerance and even help increase the amount of insulin that the body is producing. These studies are in the infant stages, but it will be interesting to see if overtime they show promise of helping patients. 8. Eating Pumpkins helps to Protect Your Heart. A Harvard study of over 40,000 participants found that those who ate a diet that is rich in fiber (like the amount that pumpkins hold) had a significant lower risk of coronary heart disease. A recent study done in Sweden showed that women who ate a diet high in fiber had a 25% lower risk of heart disease. 9. Eating Pumpkins helps to treat Intestinal Parasites. According to Debbie Edson from Living Well Magazine, pumpkin seeds can help your body get rid of nasty gut parasites that make us sick. Interestingly enough, Pumpkin seeds have been used for this exact purpose by Native Americans and in some parts of Africa Pumpkin seeds are used to treat tapeworms. Isn't that amazing friends? 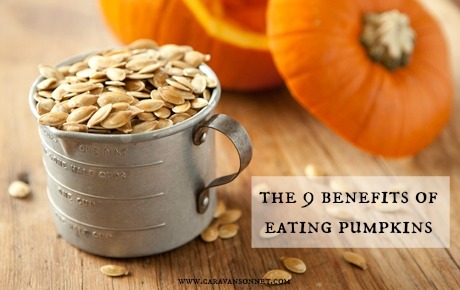 Those are just 9 benefits of eating pumpkins and there are so many more! What about y'all? Do you eat pumpkins or pumpkin seeds? What health benefits have you found from eating them?